1I’ve argued that the objection that reveals the deepest problem for event-causal libertarianism is what I call the disappearing agent argument (Pereboom 2004, 2014, 2017). This objection has recently been the target of several illuminating criticisms, and in what follows I respond to them, thereby clarifying the nature of the argument. Other arguments against event-causal libertarianism include the present luck objection (e.g., Haji 2004, Mele 2006), and the objection that the event-causal view does not yield enhanced control relative to that available given causal determination (e.g., O’Connor 2000, Pereboom 2001, Clarke 2003). I will explain why I believe that the disappearing agent argument is the strongest of the three, and is best at focusing our attention on the core concern for event-causal libertarianism. 2This objection is related to a similar disappearing agent argument that targets not just event-causal theories of moral responsibility, but any event-causal theories of action, whether indeterministic or deterministic (e.g., Velleman 1992, Hornsby 2004, Steward 2012). I’ve said that I am cautiously sympathetic to this more general argument (Pereboom 2014, 2015), but that I don’t need to endorse it to affirm the disappearing agent argument against event-causal libertarianism (Pereboom 2014, p. 32, note 1). But Al Mele (2015) and Laura Ekstrom (2016) ask whether endorsing the less general argument commits me to the more general one. I will explain my position on this issue, a key to which is that I believe the more general argument to be significantly weaker. 3Three kinds of libertarianism have been proposed, distinguished by the causal story they tell: event-causal, agent-causal, and non-causal libertarianism. In event-causal libertarianism, actions, conceived as agent-involving events – as agents acting at times – are caused solely by prior events, such as an agent’s having a desire or a belief at a time, and some type of indeterminacy in the production of actions by appropriate events is held to be necessary for the action to be free in the sense required for moral responsibility (e.g., Kane 1996; Ekstrom 2000; Balaguer 2010; Franklin 2011). In my view, the notion of moral responsibility at stake in the free will debate is the one that involves basic desert.1 I am counting basic actions such as decisions, and more generally, the formation of intentions, as actions. In theories that I will classify as within the event-causal libertarian camp, actions are indeterministically caused by states or property instances. This type of position has an early representative in the Epicurean view according to which a free decision is an indeterministically caused swerve in the otherwise downward path of an atom (Lucretius 50 BCE). 4In agent-causal libertarianism, free will of the sort required for moral responsibility is accounted for by the existence of agents who fundamentally as substances have the power to cause actions without being causally determined to do so (e.g., O’Connor 2000, 2008; Clarke 2003). The causation involved in free action is not reducible to causation among events, and what ensures this is that the agent, fundamentally as a substance, has the power to cause an action. For an action to be free it’s crucial that the agent who causes the action is not causally determined to cause it. 5The third kind of libertarianism is non-causal (e.g., Bergson 1889/1910; Ginet 1997, 2007; McCann 1998; Goetz 2008). Early non-causal views arose in the context of a Kantian framework, according to which ‘causation’ is a concept we impose on spatial and temporal experience, and its applicability to some phenomenon requires that it be law-governed. Henri Bergson, an early non-causalist, contends that although actions occur in time, the time of conscious agency does not feature the magnitudes that mark the applicability of causal laws. Any attempt to theorize about conscious agency will involve invoking causal concepts, which are derived from physical theory, but do not in fact apply and are at best metaphorical. Conscious agency is sui generis, it is not subject to theorizing and is not causal in nature. This independence of causality, on Bergson’s account, allows actions to be free. Contemporary non-causalists don’t invoke this Kantian framework, at least not explicitly. In Carl Ginet’s view, for a basic action to be free it must have an agent as a subject, it cannot be caused, and it must have an actish phenomenological feel. In place of the actish phenomenological feel, Hugh McCann specifies that the action be intentional, and intrinsically and fundamentally so, so that an action’s being intentional is not in turn to be analyzed causally. On Stewart Goetz’s conception, the action must satisfy a teleological requirement, and since McCann’s intrinsic intentionality is teleological as well, their positions are similar in one key respect. 6A significant difference between the non-causal view on the one hand and the event- and agent-causal views on the other is that for the non-causalist control in action is not, or at least not necessarily, a matter of the action’s being caused by the agent or by agent-involving events. For the other views, control is necessarily a causal matter. This difference is important to the discussion that follows. 7If the disappearing agent argument undermines event-causal libertarianism, libertarians may turn the agent-causal or to the non-causal version instead. In my view, neither of these alternatives falls to the disappearing agent argument, and each yields a response to this objection. 9I call this objection the ‘disappearing agent argument’ because the agent (metaphorically) vanishes at the point at which we expect that she can settle whether the decision occurs. (Randolph Clarke (2017) suggests that a better moniker might be the ‘fading agent objection,’ since I’m open to the claim that agency is preserved in such situations.) The concern is that because event-causal libertarian agents do not have the power to settle which decision occurs, they cannot have the role in action that secures the control that moral responsibility demands. I use the equipoise situation only as a paradigm case. Event causal libertarians generally accept freedom of choice in non-equipoise situations. The concern about settling arises in such contexts as well. 10David Palmer (2013) and Al Mele (2015) ask for clarification on what it is for an agent to settle whether a decision occurs. I reply as follows (Pereboom 2017): First, to settle whether to A or to not-A, or equivalently, which of A and not-A occurs, is to determine, not necessarily causally, which of these options occurs.2 As a matter of the psychology of action, in the typical case what an agent aims to settle is not whether a decision occurs; the focus is instead on a bodily motion, such as my raising my arm (e.g., Steward 2012, 32-36; Runyan 2016, 1630), or a mental analogue, such as my imagining my childhood home. The agent then determines that she decides to A by determining to A; I determine that I decide to raise my arm by determining that I raise my arm. Mele writes: ‘‘in deciding to A, one settles upon A-ing (or upon trying to A), and one enters a state—a decision state—of being settled upon A-ing (or upon trying to A)’’ (Mele 1992: 158–59). As he points out, in some possible cases one’s focus in deliberating is on whether to decide to A by contrast with whether to A. If the evangelist says: “The time to decide has come – will you decide to commit your life to Jesus Christ?” and you believe that your eternal fate depends on your decision, specifically, you may focus on whether to so decide. Mele is correct to think that this would be an unusual type of case. We don’t typically focus on the decision, but on the action at which the decision aims; we then settle whether the decision occurs by virtue of settling on the action. An agent settles which option for action occurs just in case she determines, not necessarily causally, which action occurs, and she makes the difference as to which action occurs. 12A leading issue at stake in the free will debate is whether we have the control in action required for moral responsibility in the basic desert sense. For an agent to settle which option for action occurs is for her to exercise a crucial sort of control in action, the sort on which our being morally responsible in this sense would have to depend. For the event-causal libertarian, control is exclusively causal matter. For such an event-causalist, then, settling will be a causal matter, and plausibly both the determination and difference-making aspects of settling will be causal as well. 13Steward (2012) and Clarke (in correspondence, cf. 2017) suggest that the settling relation is a relation between a concrete particular such as an event or an agent, and a proposition. On this conception, the settling relation cannot be causal, since the relevant relation to propositions, paradigmatically making-true, is essentially non-causal. But this isn’t my notion of settling; it’s not the one that I invoke in my disappearing agent argument. Clarke (in correspondence) agrees that on his essentially non-causal notion, whether settling relations obtain may depend on some causal relation. My notion of settling might then pick out the causal relation that fixes whether Clarke’s essentially non-causal relation of settling obtains. (S-EC) An agent settles whether an action occurs if it is caused by certain reasons of hers, where the absence of those reasons would not have caused that action. 17To settle which option for action occurs is an exercise of control in action, and its characteristics are determination and difference making. Mele (2015) correctly specifies that this is an exercise of direct control in acting, by contrast, with, say, gathering evidence and weighing reasons concerning how to act. 21Later, in his response (Balaguer 2014) to my commentary (Pereboom 2013) on his (2010) book, Balaguer indicates that he endorses the same response to the disappearing agent argument. (SR) If an agent S freely decides at time t to A, then S settles at t whether that decision is made then. On an event-causal libertarian picture, the relevant causal conditions antecedent to the decision, i.e., the occurrence of certain agent-involving events, do not settle whether the decision will occur (Pereboom 2014, 32). Standard libertarian accounts—including standard event-causal libertarian views— require that directly free decisions aren’t determined by anything that precedes them. Proponents of such views, if they accept a settling requirement, will take it to require that when an agent exercises free will in making a decision, the settling takes place when the decision in question is made, not prior to that time. The Rejoinder: the making of the decision by S at t to A settles whether the decision is made then. After all, that matter is not settled by anything prior to t (for the decision is not determined by anything prior to t); and nothing more than the making of the decision at t is needed to settle the matter then. Further, since it is S who makes the decision, S, in making that decision, settles at t whether that decision is made then. For given that nothing prior to t settles whether that decision is made then, S need not do anything more than decide at t to A in order to settle at t whether that decision is made then. An event-causal libertarian theory, then, has the resources to satisfy the settling requirement SR. The proposal is that there is an identity between the making of the decision and the occurrence of the mental action of deciding, and that the occurrence of the mental action of deciding settles which decision occurs. Clarke’s thought is that the occurrence of the mental action of deciding settles which decision occurs in the sense of making a certain proposition about the decision true (2017, and from correspondence). Now I agree that such a use of ‘settling’ is fine linguistically. But it’s not what I mean by ‘settling.’ Settling, as I use the term in the context of the disappearing agent argument, is an exercise of control, and the event-causal libertarian is committed to this exercise of control being a causal matter. The relation between the occurrence of the mental action of deciding and whether the decision occurs is not a causal relation, and thus the Rejoinder is at odds with the principle that the control involved in settling is a causal matter. 24How should we interpret “the making of the decision by S at t to A,” given the event-causal view, and the supposition that this phrase picks out an exercise of control that is an instance of settling in the sense of ‘settling’ that I have in mind? The making of the decision by S would consist in the causing of the event S’s deciding to A at t by S-involving events, say (desire) E1 and (belief) E2. In Balaguer’s example, Ralph’s just-deciding is caused by, say, his desiring to star on Broadway and his believing that moving to New York will facilitate this aim. But given indeterminism and equipoise, there will be other events, E3 and E4, set to cause the alternative action-event, S’s deciding to B at t, in Ralph’s case, deciding to stay in Mayberry, with the same antecedent probability. However, at this point there is nothing left to settle whether S’s deciding to A at t by contrast with S’s deciding to B at t occurs. Only E1-E2 and E3-E4 are candidates for this role, but they don’t settle which decision-event occurs. This is the disappearing agent argument, and so far we’ve encountered no convincing event-causal libertarian response. 25But Clarke (2017) develops an interesting idea that stands to advance the discussion. He notes that on one variety of the agent-causal view, decisions are agent-causings, which in turn might be analyzed as activations of an agent-causal power (DeRose 1993; O’Connor 2000, 51). On this picture, which decision occurs is not settled by the agent causing it, but instead by virtue of its being an agent-causing. Clarke then proposes that we adapt this suggestion to the event-causal view. In that case, the decision is an event-causing, and we can plausibly claim that its occurrence is settled by virtue of its being identical to the event-causing. This proposal appears to combine the specification that settling is a causal matter with the thought that which decision occurs is settled by virtue of an event or state with which it’s identical. 26However, unless more is said (and more may be said – see below), this conception of the agent-causal position doesn’t really preserve the specification that control is a causal matter. In this conception, the agent does not cause her causings, and thus the relation between the agent and the decision is in fact non-causal. On a natural interpretation of the specification that control is a causal matter the control that agent causation supplies is control over what an agent causes. A view on which agents don’t cause decisions, but instead exercise control over decisions by virtue of their being agent-causings, is not in accord with this natural interpretation. I would place this view, and its event-causal analogue, in the non-causal camp. 27But there is a related interpretation of the agent-causal position that genuinely preserves the specification that agents exercise control over what they cause, in particular in the case of decisions. When an agent acts freely, what she typically does most fundamentally is to cause an action, by contrast with causing a decision to perform that action. (This accords with Mele’s suggestion about settling cited earlier. (Mele 1992, 158–59)) Further, it is a logical consequence of S agent-causing action A at t1 that the event S’s causing A at t1 occurs. It is a logical consequence of the fact that I agent-cause my raising my arm at t1 that the event my agent-causing my raising my arm at t1 occurs. In addition, we can plausibly specify that here my agent-causing my raising my arm at t1 is identical to my deciding to raise my arm at t1. Now, to adapt a suggestion of Roderick Chisholm’s (1971), we can propose that in agent-causing my raising my arm at t1 I also bring about the event my agent-causing my raising my arm at t1 – that is, I also bring about my deciding to raise my arm at t1. Since bringing about just is causing, I thus also cause my deciding. In this way, the agent-causalist can preserve the view that control over decisions is a kind of control over what an agent causes. 28The event-causal analogy to this picture is as follows. S can exercise control over action A by virtue of S-involving events causing A. S’s deciding to A at t1 would in such cases be identical to the complex event S-involving events causing A at t1. In causing A at t1, the S-involving events bring about, and thus cause, the event S-involving events causing A at t1, which is S’s deciding to A at t1. However, given motivational equipoise, the S-involving events don’t settle whether A occurs, and thus don’t settle whether the decision to A occurs. In this analogy, the causes of the decision are inherited from the action, and since the causes of the action don’t settle whether the action occurs, they don’t settle whether the decision occurs either. This view thus falls to the disappearing agent argument. Perhaps the general lesson is that the disappearing agent argument successfully targets any event-causal view on which control in deciding is control over what an agent causes. 29Alternatively, one might just specify that “the making of the decision by S at t to A” and “Ralph’s just deciding to move to New York” are to be interpreted non-causally. In accord with this suggestion, Balaguer (2014) proposes a response to the disappearing agent argument that features a combination of event-causal and non-causal relations. Resisting the agent-causal resolution, he says: “in this [equipoise] scenario, the event that settles which option is chosen is the conscious decision – i.e., the event with a me-consciously-choosing-now-phenomenology” (2014, 83). On one non-causal option, “the making of the decision by S at t to A” and “S’s just deciding to A” amount to a being-the-subject-of relation between S and A together with, say, intrinsic intentionality. This option might be considered on its own merits, but it is at odds with the view that control exercised in settling is a causal matter, a commitment of event-causal libertarianism, at least as it’s usually set out. 30My main objection to non-causalism is that its proponents, such as Ginet (1997, 2007) agree that in the case of a basic action the agent makes the action happen and makes the difference as to when it will happen, but making-happen and this sort of difference-making would seem to be causal relations (Pereboom 2014, 39-47). My concern is that despite the claim of non-causalism, the settling relation would seem to be causal after all. A genuinely non-causal view, on the other hand, faces the problem of accounting for the control in action required for responsibility in a non-causal way. 31Clarke’s and Balaguer’s deflationary views, if interpreted in a resolutely event-causal way, are subject to the disappearing agent argument after all, given my notion of ‘settling.’. They might also be interpreted non-causally, but then they fall afoul of a key commitment of event-causal libertarianism, that control in action is a causal matter, when this is interpreted as the claim that in action agents exercise control over what they cause. 32Mele (2015) argues, plausibly, that on event-causal libertarian views it remains correct to say that agents, and not events, decide and make decisions. “[Sam] has and exercises the ability or power to sink free throws, and he sinks many of them. His intentions, beliefs, skills, and the like do not sink free throws – alone or in combination with one another. And that is no surprise, because they are not able to sink free throws.” Similarly, in her response to the disappearing agent argument Laura Ekstrom (2016) writes: “it is something about the agent that settles which decision occurs: the agent exercises her will in making a decision for reasons. In the case of the writer, for instance, in making the decision to spend the afternoon working on her paper, she settles what to do with her afternoon.” Both Mele and Ekstrom are resolute in their adherence to the event-causal libertarian protocol; neither wishes to shift to a non-causal or an agent-causal alternative. But Ekstrom does employ ordinary agent talk, by contrast with language that is explicitly event-causal, in response to the disappearing agent argument., and Mele seems to be suggesting that it helps. 34An event causalist might endorse the semantic position according to which ‘Sam sunk the free throw’ can be true, but the causal relations that ground its truth are solely event-causal relations (Bishop 1989). I maintain that the disappearing agent argument succeeds against an event-causal libertarianism that endorses this semantic position. For given equipoise, once the event-causal relations that ground the truth of the ordinary agent talk are specified, the settling problem becomes evident. I also contend that the argument also successfully challenges a libertarian view according to which the agent is a substance cause of action, while all substance-causal relations reduce to event-causal relations. Given equipoise, once the reduction base is specified, the settling problem again becomes evident. 36Mele (2015), Ekstrom (2016), and Clarke (2017) ask whether the disappearing agent objection extends to a successful objection to event-causal theories of action generally, whether indeterministic or deterministic. Mele remarks that given my rejection of agent-causal libertarianism, I’d be left without action, which is bad. But I’m open to the claim that the argument does so generalize (Pereboom 2015). There is something the agent wants, and there is an action that he believes conducive to its attainment. His desire for the end and his belief in the action as a means justify taking the action, and they jointly cause an intention to take it, which in turn causes the corresponding movements of the agent’s body. Provided that these causal processes take their normal course, the agent’s movements consummate an action, and his motivating desire and belief constitute his reasons for acting (Velleman 1992, 461). In full-blooded action, an intention is formed by the agent himself, not by his reasons for acting. Reasons affect his intention by influencing him to form it, but they thus affect his intention by affecting him first. And the agent then moves his limbs in execution of his intention: his intention doesn’t move his limbs by itself. The agent thus has at least two roles to play: he forms an intention under the influence of reasons for acting, and he produces behavior pursuant to that intention (Velleman 1992, 462). You experience your arm, hand, and fingers as being moved by you yourself – rather than as experiencing their motion either as fortuitously moving just as you want them to move, or passively experiencing them as being caused by your own mental states. You experience the bodily motion as generated by yourself” (Horgan 2007, 187). 40Nida-Rümelin adduces an additional claim about the phenomenology that would count against the event- or state-causal view. On her account, when one actively does something over moderately extended periods of time, such as slowly raising one’s arm, the phenomenology is not as if one is experiencing a causal connection between one’s intention and a bodily change (2007, 259). Horgan concurs; in the case of raising one’s arm and clenching one’s fist, it’s not as if the phenomenology involves “first experiencing an occurrent wish for your right hand to rise and your fingers to move into clenched position, and then passively experiencing your hand and fingers moving in just this way,” or first experiencing this occurrent wish “and then passively experiencing a causal process consisting of this wish’s causing your hand to rise and your fingers to move into clenched position” (Horgan 2007, 186). These considerations give rise to a disappearing agent objection to event- or state- causal theories of action (Hornsby 2004a and b; Steward 2012). Although the agent must possess an identity apart from the substantive motives competing for influence over his behavior, he needn’t possess an identity apart from the attitude that animates the activity of judging such competitions. If there is such an attitude, then its contribution to the competition’s outcome can qualify as his – not because he identifies with but rather because it is functionally identical to him (Velleman 1992, 480; Velleman 2000, 141). 42The objection to this account that I want to raise is that it cannot account for the settling role in action that the agent intuitively can have in situations of rational equipoise. Ralph is torn about whether to stay in Mayberry or move to New York, and his reasons for each option are and appear to him to be in equipoise. Yet he just chooses to move to New York. It can’t be a desire to act in accord with the best reasons that settles how Ralph acts, since this desire does not favor moving to New York over staying in Mayberry. Thus given Velleman’s functional account of the agent, Ralph can’t settle which option becomes actual, and so in this sort of situation he can’t act. This counts against Velleman’s proposal (Pereboom 2015; cf. Runyan 2016, 1633-34; this objection also challenges against Franklin’s (2014) development of Velleman’s view). 43Laura Ekstrom (2000, 2003, 2016) develops a related account, one that ties the agent to her undefeated authorized general preferences, where such preferences are non-coercively formed or maintained, and are caused but not causally determined by considerations brought to bear in his deliberation. But this account is also subject to the objection that it can’t account for settling in equipoise situation. In Robert Kane’s (1996) example of a torn decision, a businesswoman can either decide to stop and help an assault victim for moral reasons, or else decide to speed on to work for self-interested reasons, and these reasons are in motivational equipoise. We can imagine that she has both moral and self-interested undefeated authorized general preferences. What if these general preferences are in motivational equipoise as well, so that now the decision would not only be torn, but in this sense meta-torn? Still, intuitively, the businesswoman can still settle whether to stop and help or speed on to work. This counts against Ekstrom’s proposal. 44If agent causation is required to solve the disappearing agent problem for event-causal libertarianism, now it appears to be required to solve a disappearing agent problem that arises for the event-causal theory of agency more generally. However, I pose a problem for agent-causal libertarianism that motivates me to accept free will skepticism instead (Pereboom 2001, 2014). This leads Mele (2015) to ask whether I am now left without an account of agency. But at this point it’s open to me to invoke a notion of agent causation compatible with the causal determination of action (Pereboom 2015), since, as I explain below, the difficulty I raise for agent-causal libertarianism does not extend to deterministic agent causation, in recent times proposed by Ned Markosian (1999, 2010) and Dana Nelkin (2011). As on the libertarian version, agency (or at least full-blooded agency) is accounted for by the existence of agents who as substances have the power to cause actions. But by contrast with the libertarian counterpart, in the exercise of their agent-causal power agents are in general causally determined by factors beyond their control. 45The difficulty I raise for agent-causal libertarianism is that it cannot be reconciled with what we would expect given our best physical theories (Pereboom 1995, 2001, 2014). Consider first the supposition that all the events in the physical world are governed by deterministic laws. In the agent-causal libertarian picture, when an agent makes a free decision she causes the decision without being causally determined to do so. On the path to action that results from this undetermined decision, changes in the physical world, for instance in her brain or some other part of her body, are produced. But it would appear at this point we would encounter divergences from these laws. The changes in the physical world that result from the undetermined decision would themselves not be causally determined, and they would thus not be governed by deterministic laws. One might object that it is possible that the physical changes that result from every free decision just happen to dovetail with what could in principle be predicted on the basis of the deterministic laws, so nothing actually occurs that diverges from these laws. But this proposal would seem to involve coincidences too wild to be credible. Thus agent-causal libertarianism is not plausibly reconcilable with the physical world’s being governed by deterministic laws. 46On some interpretations of quantum mechanics, the physical world is not in fact deterministic, but is rather governed by probabilistic laws. But wild coincidences would also arise on this suggestion. Consider the class of possible actions each of which has a physical component whose antecedent probability of occurring is approximately 0.32. It would not violate the laws in the sense of being logically incompatible with them if, for a large number of instances, the physical components in this class were not actually realized close to 32% of the time. Rather, the force of the statistical law is that for a large number of instances it is correct to expect physical components in this class to be realized close to 32% of the time. Are free choices on the agent-causal libertarian model compatible with what the probabilistic law would have us to expect about them? If they were, then for a large enough number of instances the possible actions in our class would almost certainly be freely chosen near to 32% of the time. However, if the occurrence of these physical components were settled by the choices of agent causes, then actually being chosen close to 32% of the time would amount to a wild coincidence. The proposal that agent-caused free choices do not diverge from what the statistical laws predict for the physical components of our actions would be so sharply opposed to what we would expect as to make it incredible (Pereboom 1995, 2001). 47But deterministic agent causation is not undermined by this concern about reconciliation with the laws of nature. If the laws of nature are deterministic, and agent causation is deterministic, then instances of agent causation might all be governed by the laws of nature. 6 Thanks to Colin McLear and Simon-Pierre Chevarie-Cossette for valuable discussion of this issue. 50But Christopher Franklin (2016) develops a response to this argument, one that persuades me. Given that I allow for deterministic agent causation, and that I am open to the possibility that indeterministic agent causation does secure the sort of free will required for moral responsibility, then relative to deterministic agent causation mere relaxing of the causal net may indeed precipitate the sort of control required for moral responsibility. So I cannot accept the general principle that mere relaxation of the causal net cannot enhance control in the relevant way, a principle essential to the “no enhanced control” objection. 51Consider next the present luck objection to event-causal libertarianism (Mele 1999, 2006; Haji 2004; Clarke 2017). Suppose that S’s deciding to A at t1 satisfies the event-causal libertarian’s conditions for free action. Then, given exactly the same conditions antecedent to t1 as those that precede S’s decision in the actual world, S’s deciding to A at t1might not have occurred. So there is a non-actual possible world, W*, that shares a history up to t with the actual world, W, but while S’s deciding to A at t1 occurs in W, it fails to occur in W*. Thus the fact that S’s deciding to A at t1 did actually come about would seem to be a matter of responsibility-undermining luck. G: S’s agent-causing A at t.
53As Mele (1999, 2006) and Haji (2004) emphasize, given the same history antecedent to t1 as those that precede G, and given the indeterminism of the agent-causal libertarian view, G might not have occurred. Thus there is a non-actual possible world, W*, that shares a history up to t1 with the actual world, W, but while G occurs in W, it fails to occur in W*. But is the fact that G occurred merely a matter of responsibility-undermining luck? On my preferred version of the agent-causal libertarian view, what the agent-as-substance does most fundamentally is to cause A, and the proposal is that it is in causing A that her responsibility-conferring control over A is located. The substance-causal relation is embedded in event G, and thus G will not be what is most fundamentally caused. The agent-causal libertarian maintains that the crucial control is not exercised by way of events that precede G, but by the agent-as-substance. If in addition to the events that precede G we hold fixed in W and W* the agent-as-substance’s exercise of her agent-causal power, G will occur in W and not in W*, but only because the agent-as-substance causes the action A in W but not in W*. For this reason, it isn’t a matter of responsibility-undermining luck that G occurs in W.
Balaguer, M. 2010. Free Will as an Open Scientific Problem, Cambridge MA: MIT Press. Balaguer, M. 2014 “Replies to McKenna, Pereboom, and Kane,” Philosophical Studies 169, pp. 71-93. Bergson, H.. 1889/1910. Essai sur les données immédiates de la conscience, Paris: F. Alcan, 1889; translated as Time and Free Will by F. L. Pogson, London: Allen and Unwin, 1910. Bishop, J. 1989. Natural Agency, Cambridge: Cambridge University Press. Chisholm, R. 1971. “Reflections on Human Agency,” Idealistic Studies 1, pp. 33-36. Clarke, R. 2003. Libertarian Accounts of Free Will, New York: Oxford University Press. Clarke, R. 2010. “Are We Free to Obey the Laws?” American Philosophical Quarterly 47, pp. 389-401. Clarke, R. 2013. “Some Theses on Desert,” Philosophical Explorations 16, pp. 153-64. DeRose, K. 1993. “Review of William Rowe’s Thomas Reid on Freedom and Morality,” Philosophy and Phenomenological Research 53, pp. 945-49. Ekstrom, L. W. 2000. Free Will, A Philosophical Study, Boulder CO: Westview. Ekstrom, L. W. 2003. “Free Will, Chance, and Mystery,” Philosophical Studies 113, pp. 153-180. Ekstrom, L. W. 2016. “Towards a Plausible Event-Causal Account of Free Will,” Synthèse DOI 10.1007/s11229-016-1143-8. Feinberg, J. 1970. Doing and Deserving, Princeton, NJ: Princeton University Press. Franklin, C. 2011. “Farewell to the Luck (and Mind) Arguments,” Philosophical Studies 156, pp. 199-230. Franklin, C. 2014. “Event-Causal Libertarianism, Functional Reduction, and the Disappearing Agent Argument,” Philosophical Studies 170, pp. 413-32. Franklin, C. 2016. “If Anyone Should be an Agent-Causalist, then Everyone Should be an Agent-Causalist, Mind 125, pp. 1101-1131. Ginet, C. 1997. "Freedom, Responsibility, and Agency," Journal of Ethics 1, pp. 85-98. Ginet, C. 2007. "An Action Can Be Both Uncaused and Up to the Agent," in C. Lumer ed. Intentionality, Deliberation, and Autonomy, Ashgate, pp. 243-56. Goetz, S. 2008. Freedom, Teleology, and Evil, London: Continuum, 2008. Griffith, M. “Why Agent-Caused Actions Are Not Lucky,” American Philosophical Quarterly 47, pp. 43-56. Haji, I. 2004. “Active Control, Agent Causation, and Free Action,” Philosophical Explorations 7, pp. 131-48. Hornsby, J. 2004. “Agency and Actions,” in Agency and Action, H. Steward and J. Hyman, eds. Cambridge: Cambridge University Press, pp. 1-23. Kane, R. 1996. The Significance of Free Will, Oxford: Oxford University Press. Lucretius (50 BCE). De Rerum Natura, tr. W.H.D. Rouse, revised by M. F. Smith, Cambridge: Harvard University Press. McCann, H. (1998). The Works of Agency, Ithaca: Cornell University Press. Mele, A. 1992. Springs of Action. New York: Oxford University Press. Mele. 1999. "Ultimate Responsibility and Dumb Luck," Social Philosophy & Policy, 16, pp. 274–93. Mele, A. 2006. Free Will and Luck. New York, Oxford University Press. Mele, A. 2015. “On Pereboom’s Disappearing Agent Argument,” Criminal Law and Philosophy. DOI: 10.1007/s11572-015-9374-1. Markosian, N. (1999). “A Compatibilist View of the Theory of Agent Causation,” Pacific Philosophical Quarterly 80 (1999), pp. 257-77. Markosian, N. 2010. “Agent Causation as the Solution to All the Compatibilist’s Problems,” Philosophical Studies 157, pp. 383–98. Nelkin, D. 2011. Making Sense of Freedom and Responsibility, Oxford: Oxford University Press. Nida-Rümelin, M. 2007. “Doings and Subject Causation,” Erkenntnis 67, pp. 255-72. O’Connor, T. 2000. Persons and Causes, New York: Oxford University Press. O’Connor, T. 2008. “Agent-Causal Power,” in Dispositions and Causes, ed. Toby Handfield, Oxford: Oxford University Press, pp. 189-214. Palmer, D. (2013). “Event-Causal Libertarianism: Two Objections Reconsidered,” in I. Haji and J. Caouette, eds., Free Will and Moral Responsibility, Newcastle-upon-Tyne, Cambridge Scholars Press, pp. 98-122. Pereboom, D. 1995. "Determinism Al Dente," Noûs 29, 1995, pp. 21-45. Pereboom, D. 2001. Living without Free Will, Cambridge: Cambridge University Press. Pereboom, D. 2004. “Is Our Conception of Agent-Causation Coherent?” Philosophical Topics 32, pp.275-86. Pereboom, D. 2011. Consciousness and the Prospects of Physicalism, New York: Oxford University Press. Pereboom, D. 2014. Free Will, Agency, and Meaning in Life, Oxford: Oxford University Press. Pereboom, D. 2015. “The Phenomenology of Agency and Deterministic Agent Causation,” in Horizons of Authenticity in Phenomenology, Existentialism, and Moral Psychology, H. Pedersen and M. Altman, eds., New York: Springer, pp. 277-94. Pereboom, D. 2017. “A Defense of Free Will Skepticism: Replies to Victor Tadros, Saul Smilansky, Michael McKenna, and Alfred Mele on my Free Will, Agency, and Meaning in Life,” Criminal Law and Philosophy, DOI:10.1007/s11572-017-9412-2. Runyan, J. D. 2016. “Events, Agents, and Settling Whether and How One Intervenes,” Philosophical Studies 173, pp. 1629-1646. Sartorio, C. 2013. “Making a Difference in a Deterministic World,” Philosophical Review 122, pp. 189-214. Sartorio, C. 2016. Causation and Free Will, Oxford: Oxford University Press. Steward, H. 2012. A Metaphysics for Freedom, Oxford: Oxford University Press. Velleman, J. D. 1992. “What Happens When Someone Acts?” Mind 101, pp. 461-481. Velleman, J. D. 2000. “Introduction,” in J. D. Velleman, ed., The Possibility of Practical Reason, New York: Oxford University Press, pp. 1-30. 2 Laura Ekstrom (2016) appropriately warns against a characterization of settling that requires it to be causally determining. 3 This discussion of difference making corrects for problems for the earlier account I provide in (Pereboom 2015). Thanks to Richard Holton and Carolina Sartorio for valuable discussion. 4 Near the end of his comment, Mele outlines a position according to which an agent’s moral responsibility on the event-causal view can result from the shaping of her values by past free decisions. I develop an objection to this type of view in (2001: 49). 5 I’m undecided about whether such a view falls to the disappearing agent objection. For my views on constitution, grounding, and reduction, see Chapter 7 of (Pereboom 2011). Thanks to Randy Clarke for prodding me to clarify my position on this issue. 7 Thanks to audiences at the Collège de France in September 2016 and at Balliol College, Oxford University in May 2017 for enlightening discussions. Thanks also to Simon-Pierre Chevarie-Cossette, Randy Clarke, Laura Ekstrom, Chris Franklin, Richard Holton, Colin McLear, Michael McKenna, Al Mele, Dana Nelkin, Tim O’Connor, and Carolina Sartorio for valuable comments and interaction. PEREBOOM, Derk. 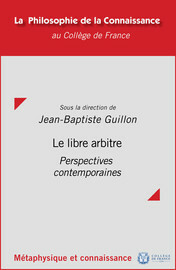 Responsibility, Agency, and the Disappearing Agent Objection In : Le libre arbitre : Perspectives contemporaines [en ligne]. Paris : Collège de France, 2017 (généré le 20 avril 2019). Disponible sur Internet : <http://books.openedition.org/cdf/4942?mobile=1>. ISBN : 9782722604797. DOI : 10.4000/books.cdf.4942. Pereboom, Derk. “Responsibility, Agency, and the Disappearing Agent Objection”. Guillon, Jean-Baptiste. Le libre arbitre : Perspectives contemporaines. Paris : Collège de France, 2017. Web. <http://books.openedition.org/cdf/4942?mobile=1>. GUILLON, Jean-Baptiste (dir.). Le libre arbitre : Perspectives contemporaines. Nouvelle édition [en ligne]. Paris : Collège de France, 2017 (généré le 20 avril 2019). Disponible sur Internet : <http://books.openedition.org/cdf/4937?mobile=1>. ISBN : 9782722604797. DOI : 10.4000/books.cdf.4937. Guillon, Jean-Baptiste, ed. Le libre arbitre : Perspectives contemporaines. Paris : Collège de France, 2017. Web. <http://books.openedition.org/cdf/4937?mobile=1>. L’une des missions du Collège de France est de diffuser la science, la pensée et la recherche nouvelles à mesure qu’elles s’élaborent. Seul ou en partenariat, il édite une grande variété de livres.